Mary Ellis 2017. Image courtesy of Oxford Times and Oxford Mail. 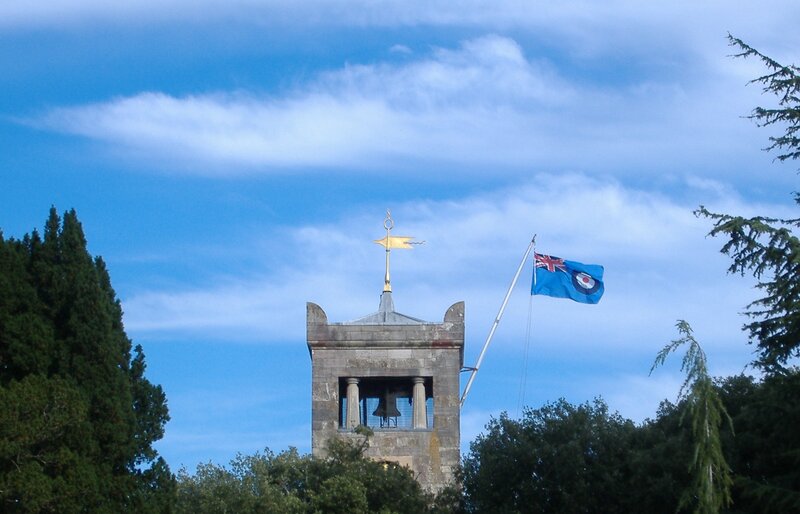 Two months after Mary Ellis slipped her earthly bonds and took her place in the history books of British Aviation, the Isle of Wight turned out to show respect for the Queen of Sandown. Over 350 people of all ages and all walks of life filled St. Mary’s Church in Cowes, even taking their seats upstairs near rafters. St.Mary’s Church, Cowes, flying the flag for Mary Ellis 24 September 2018. Copyright Anne Grant. In addition to her family and friends there were local politicians, local press and media organisations, Wight Aviation Museum members, IW Flying Club, young Air Cadets, and many octogenarians and hundreds of her many admirers. Graham Rose of ATA Association paid tribute to Mary and recalled the long friendship between Mary and his mother, the late Molly Rose. 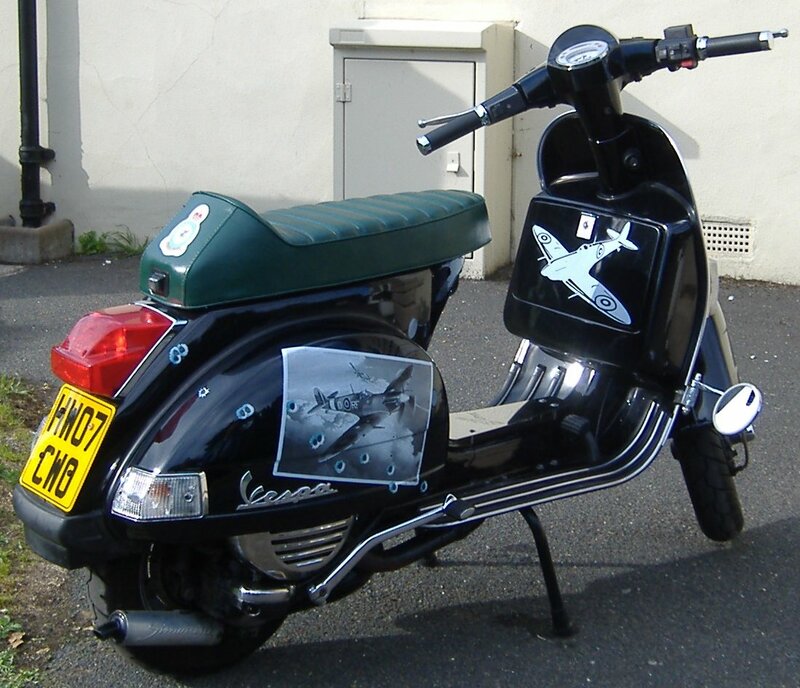 Vespa scooter decorated with Spitfires and ‘bullet holes’ parked at Northwood House on Mary Ellis Memorial Service day. Copyright Anne Grant. Derek Hermiston Hooper gave his tribute, representing the Aircrew and RFC, RNAS Associations. It was Derek who was the force behind Mary receiving the Master Pilot award. Group Captain Anne-Marie Houghton spoke of ‘Mary the inspiration.’ She had mistakenly thought her achievements in the RAF in the 1990s were a ‘first’. Then she heard about Mary Ellis and all the other women ATA pilots and she realised they had done it all before she was born. Councillor Clare Mosdell reminded us of Mary’s contribution to the Island ever since she moved here after she left the ATA, to work as personal pilot to wealthy farmer Mr. Clark. It was he who started Bees Flight and appointed Mary to run it all for him at Sandown. She built up the Airport into a thriving business, the legacy of which is that the airfield still exists today and still thrives. Author and poet Alison Hill read her ‘Spitfire Salute’ which recollected some of the outstanding moments in Mary’s final years and happy memories of their recent last meeting. After the prayers and uplifting hymns, the concluding music was the stirring ‘Battle of Britain’ theme tune. 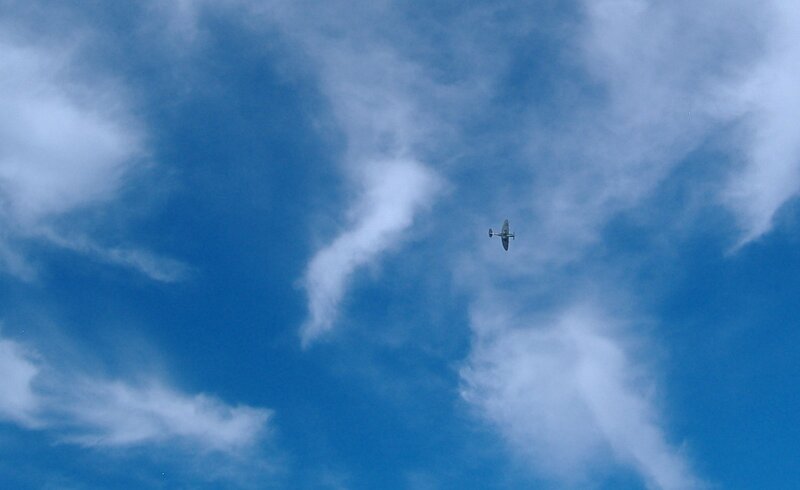 Biggin Hill Spitfire ‘Spirit of Kent’ playing with the clouds – Mary Ellis style. After the service the Biggin Hill Heritage Hangar put on a magnificent display with a flypast over Cowes seafront and Northwood House. The Mark IX Spitfire ‘Spirit of Kent’ performed an acrobatic show of high skill, to the delight of the crowd. The pilot ‘played with the clouds’ and then he was gone. 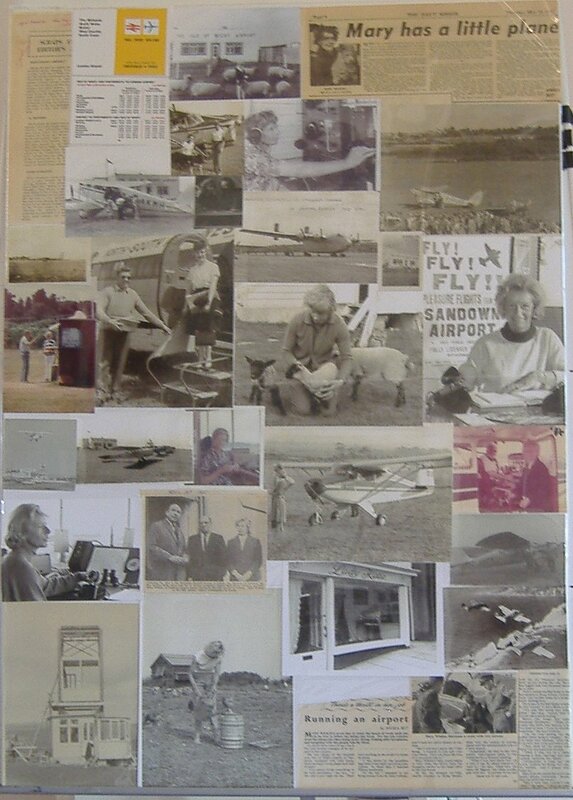 One of many Mary Ellis Memory Boards which displayed her long aviation career. Everyone stayed on in the warm September sunshine to swap personal memories of Mary. I was brought up in the old fashioned way to respect my elders and betters. This included waiting to be given permission to call them by their first name. For years I addressed Mary as Mrs Ellis while I awaited her permission until finally I asked. Blue skies Mary. 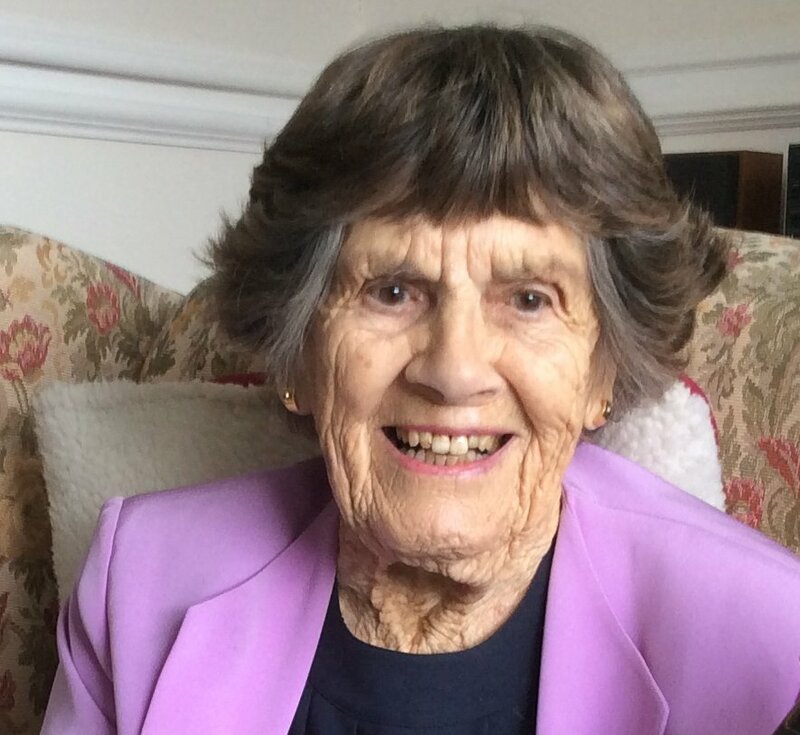 Follow this link to see the BBC coverage of Mary Ellis Memorial Service. Mary Ellis took off on her final flight on Tuesday 24 July. Joy Lofthouse and Mary Ellis at White Waltham Air Show 2017. Courtesy of Alison Hill. She left us mere mortals here on earth. There is little more that can be said which hasn’t already been said today across the media. So let’s keep it simple. Now Mary Ellis has rejoined her old pal Joy where they can play with the clouds. Heavenly Twins back together. 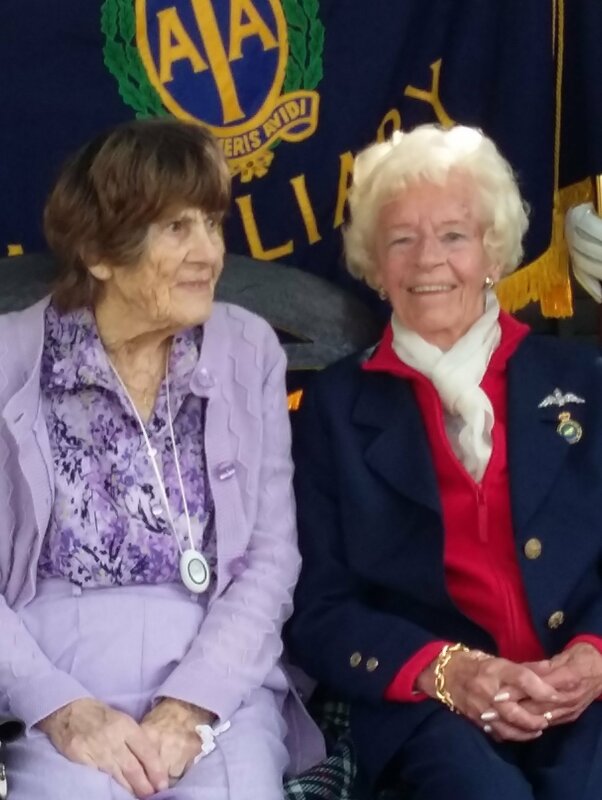 Anyone who saw the TV program celebrating the centenary of the Royal Air Force – ‘RAF 100 With Ewan And Colin McGregor’ – on BBC 1, on 25 March 2018, will have seen Spitfire pilots Mary Ellis and the late Joy Lofthouse chatting to Ewan and Colin about their Air Transport Auxiliary days. What a star Joy was with her war-time tales. She is now flying on a different plane. 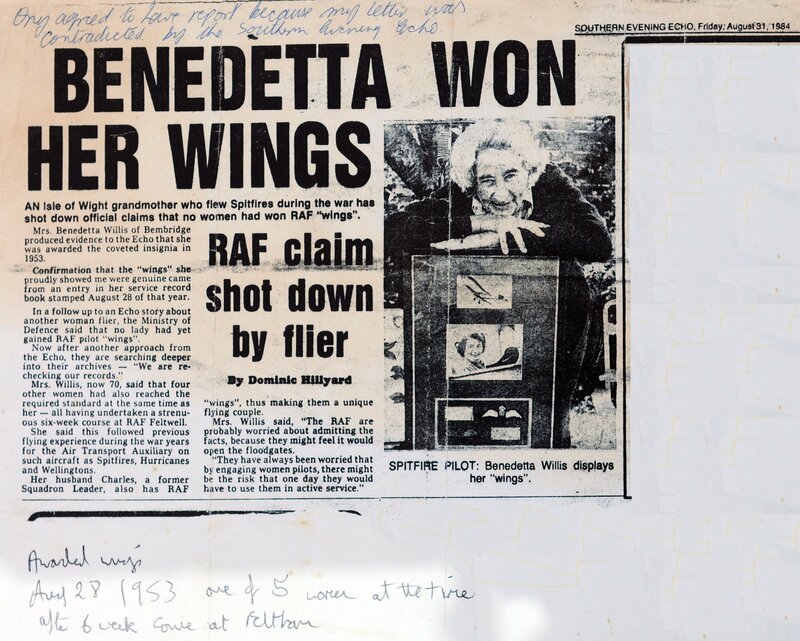 What better day to pay tribute to the late Benedetta Willis, a pilot who learned to fly in the 1930s. 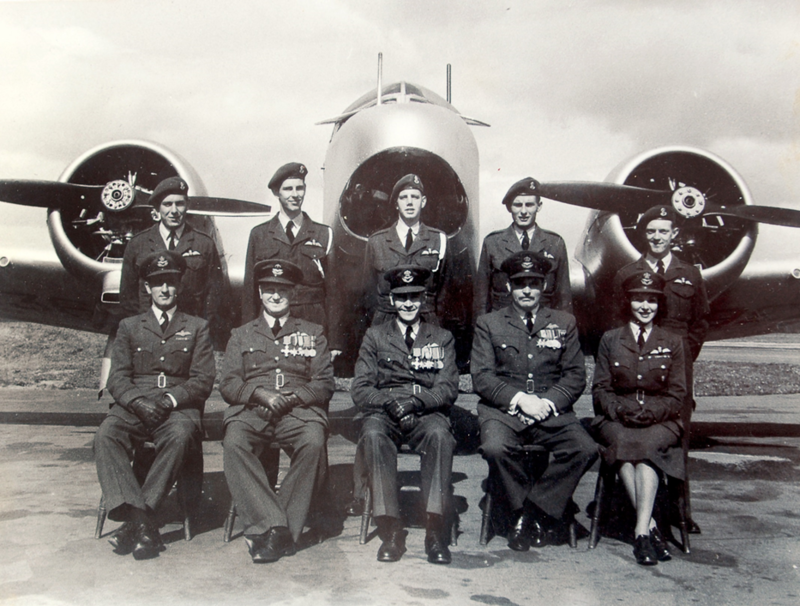 In the war years she joined the Air Transport Auxiliary as a ferry pilot. In the 1950s she was one of the few women who broke through an aviation barrier when won her Wings. In the 1980s she challenged the establishment who seemingly had developed selective memory. Benedetta was not going to let them forgot. Follow this link to Benedetta’s story. Spitfire Heroes Exhibition at RAF Museum. Candy Adkins and Angela Riddle frame the Jackie Moggridge exhibit. The current exhibition at the RAF Museum, Hendon, called the Spitfire Experience includes a selection of ‘Spitfire Heroes’. Those featured are some of the most famous names from aviation history. They are R.J. Mitchell, Joseph Smith, Jeffrey Quill, Donald Kingaby, Fred Roberts, Adolf Galland and Jackie Moggridge. 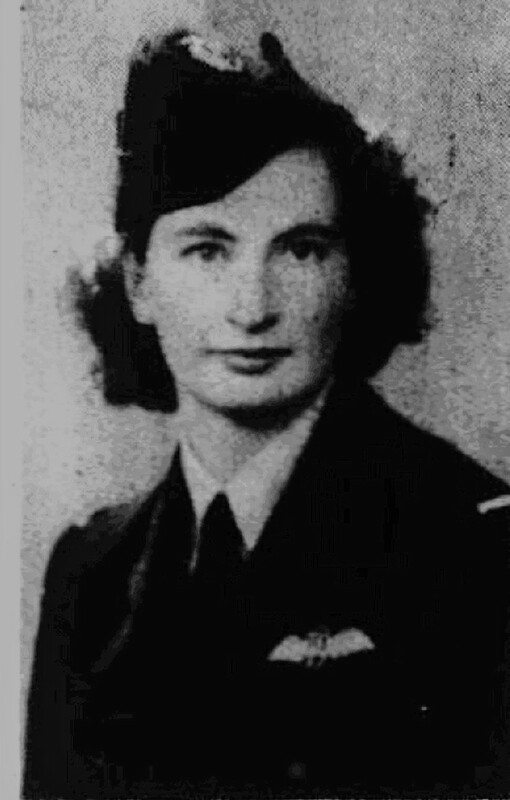 Jackie was one of 166 women (167 if you included forgotten Marjorie Spiller) and 1,152 men who filled the ranks of the Air Transport Auxiliary during the war. 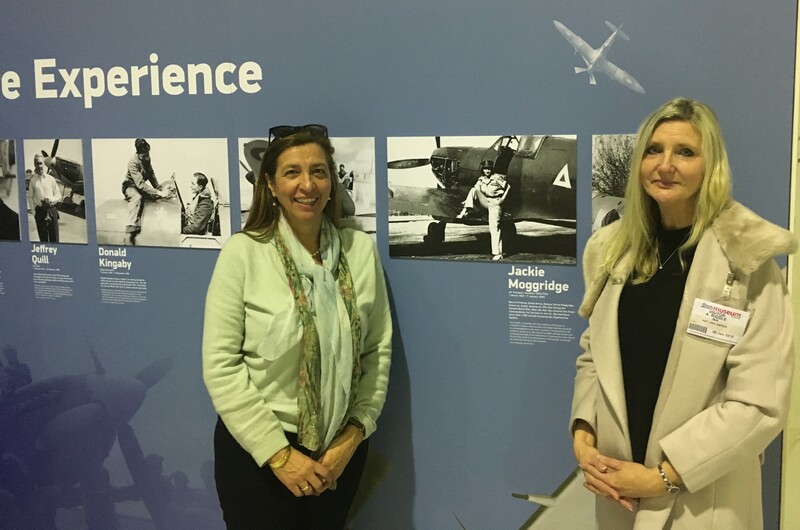 “I was invited to go to Hendon, RAF Museum to meet Jess Boydon who is filming memories of the RAF from family members. She and her cameraman were absolutely lovely and I spent two hours being filmed talking about Jackie’s exploits. I showed them her Pilot’s Notes, medals, photos and press cuttings. They are going to put these memories onto the internet and display then at the RAF 100 years exhibition. Spitfire Heroes Exhibition at the RAF Museum. Jackie Moggridge is the only woman in the exhibition. Photo taken by her daughter Candy Adkins. 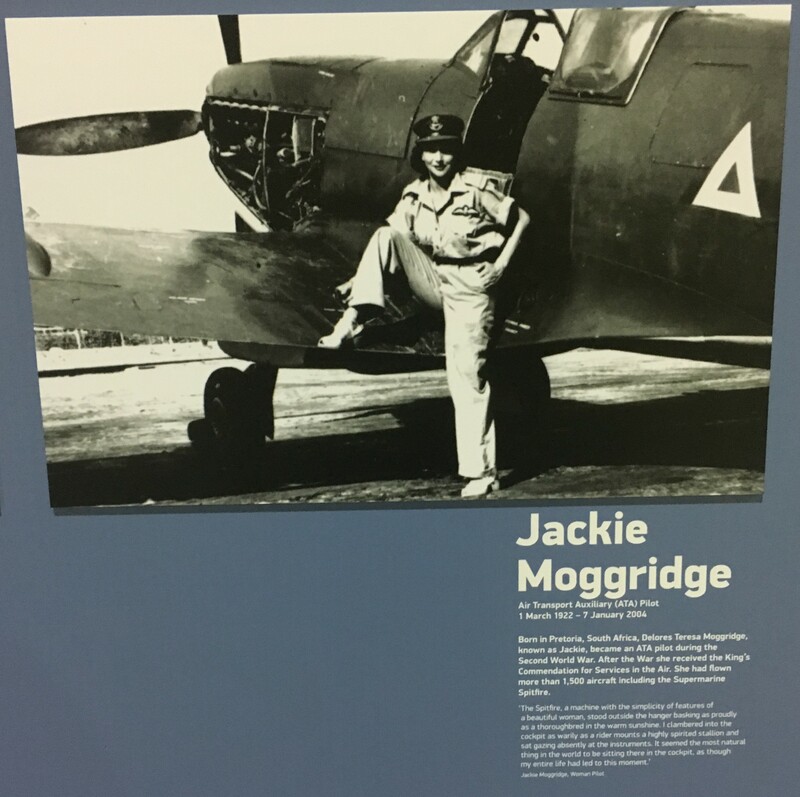 My friend Angela and I looked around the museum and saw that Jackie is on display boards at their Spitfire Heroes Experience. 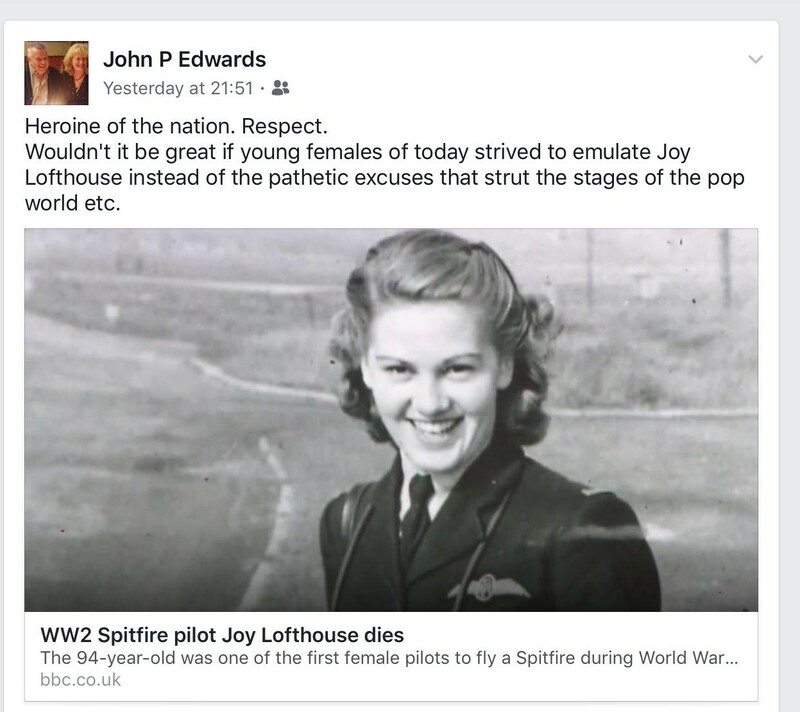 She had been one of the Spitfire pilots nominated (the only woman) in the Daily Telegraph’s Spitfire Heroes poll at the end of last year. Jackie came 3rd! She would have loved the picture they have chosen to illustrate her story. Spitfire Heroes Exhibition at the RAF Museum. 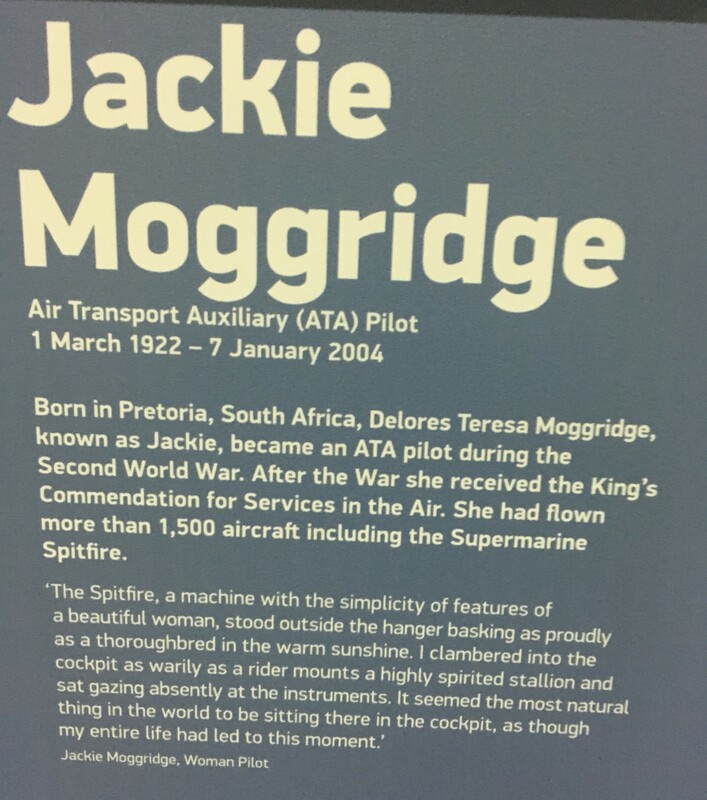 Jackie Moggridge Woman Pilot. The RAF Museum visit left quite an impression on Candy and Angela. Not all of it in a way that we might hope to expect in 2018. The reason will be the subject of a future report on this website in a few weeks from now. Watch this space, dear follower, to learn how history, disappointingly, repeats it. Wight Aviation Museum [WAM] has announced that it is to open a small, new Aviation Heritage Museum and Visitor Centre in the Spring/Summer 2018 at Sandown Airport. 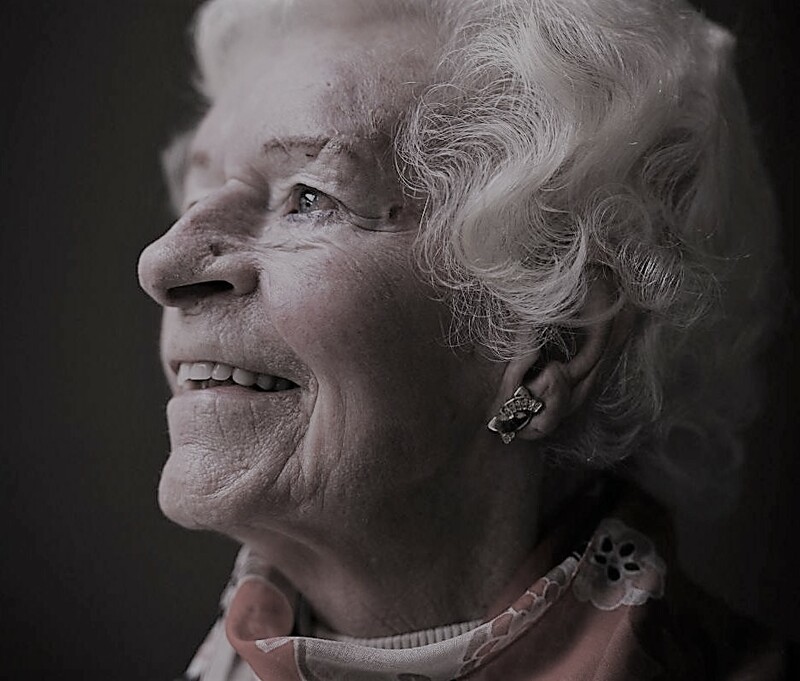 Following the announcement on 17 January that Sandown Airport’s very own Mary Ellis has been conferred with the Freedom of the Isle of Wight, the museum is pleased to confirm that there will be a very special “centre stage” exhibition in the new museum to illustrate her achievements in WW2 and to honour her as the First Lady Airport Commandant in Europe of the Airport 1950-1970. 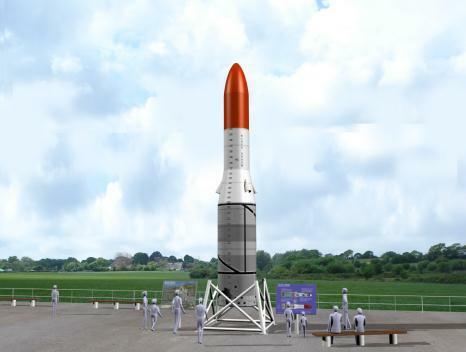 Replica Black Arrow Rocket to be built at Sandown Airport by Wight Aviation Museum. Image courtesy of Richard Curtis. For full details go to Wight Aviation Museum page. Other exciting news about what is planned by WAM can be viewed there too. To see Mary receiving the Freedom of the isle of Wight at County Hall, Newport, follow this link to OnTheWight video of the moment.